Another post from this past summer. 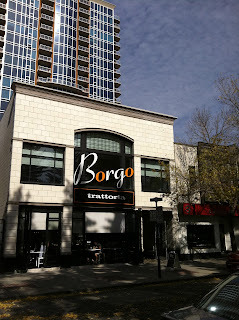 Checked out Borgo Trattoria. Located on the trendy 17th avenue, Borgo Trattoria specializes in Italian cuisine in full size plates and the ever popular tapas style. The front face feature beige block and black window mullions with "Borgo" in giant cursive across the middle. The semi open patio is packed with hungry patrons. A very lively atmosphere. Unlike other tapa places where dishes are generally offered in a serving of unknown size (typically small, but how small?!?! ), Borgo Trattoria offers many of their items in single piece servings. Two meatballs. Too many? How about one? You got it. This offers diners the opportunity to try a variety of different dishes (especially the small eaters, I'm an eating machine so it wasn't a big deal). Dishes are brought out when they are hot and ready. Except the cold dishes. Those are brought out cold. 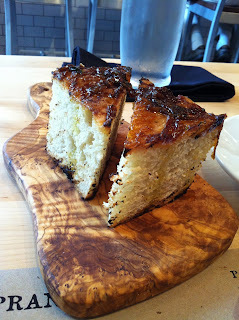 To start, we ordered two pieces of focaccia bread. Some of you may know of my unhealthy obsession with foamy focaccia bread. It makes Gollum's ring obsession look like a weekend hobby. 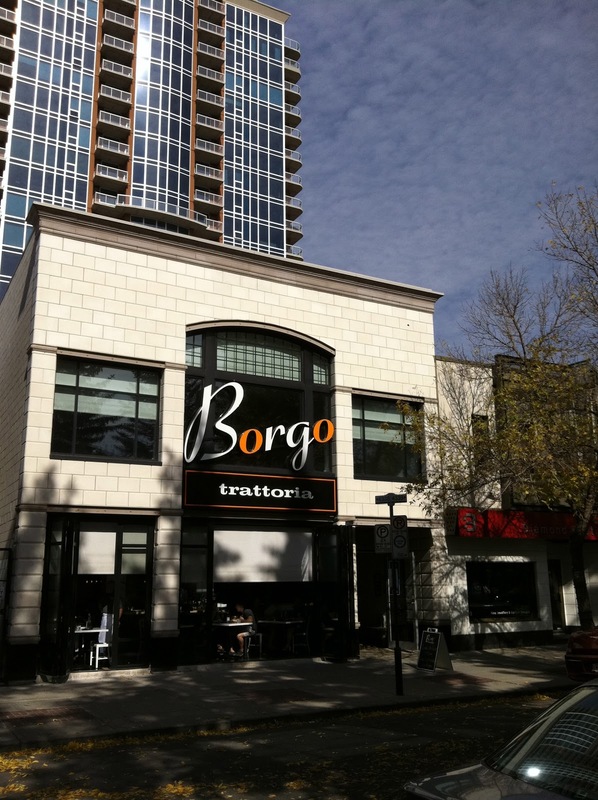 So where does Borgo's bread rank among Calgary's restaurants? In my humble opinion, it is up there with the best. 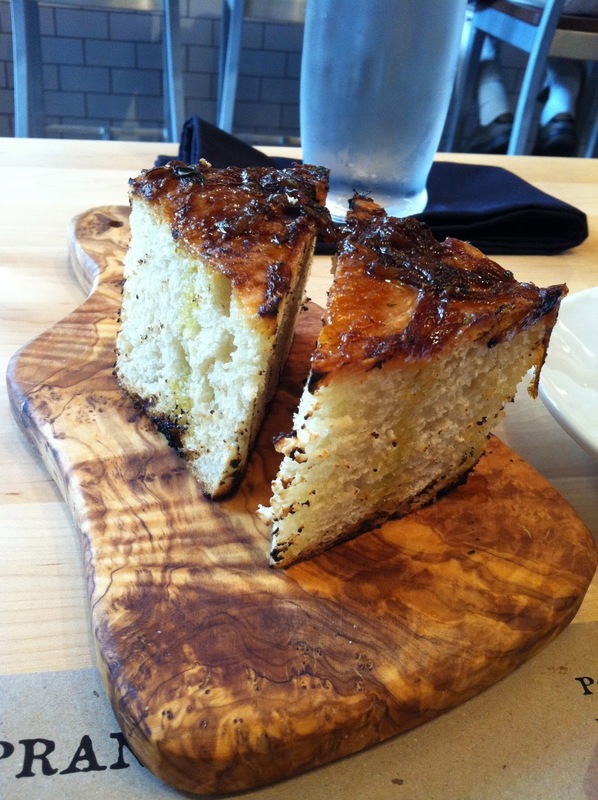 Though not as squishy as Charcut or Bonterra Trattoria, Borgo's focaccia bread is tasty in it's own way. Toasted to a golden crispy state, the bread is topped with caramelized onions. Forget the balsamic vinegar and virgin olive oil, the bread is heavenly on it's own. Ordered initially to soak up all the sauces, it was definitely tough to not gobble it all up before the other tasty dishes arrived. The classic bruschetta was the first to arrive. There aren't many Italian restaurants that don't serve bruschettas. It's like going to a Chinese restaurant and not being able to order some sort of rice dish. Not gonna happen. 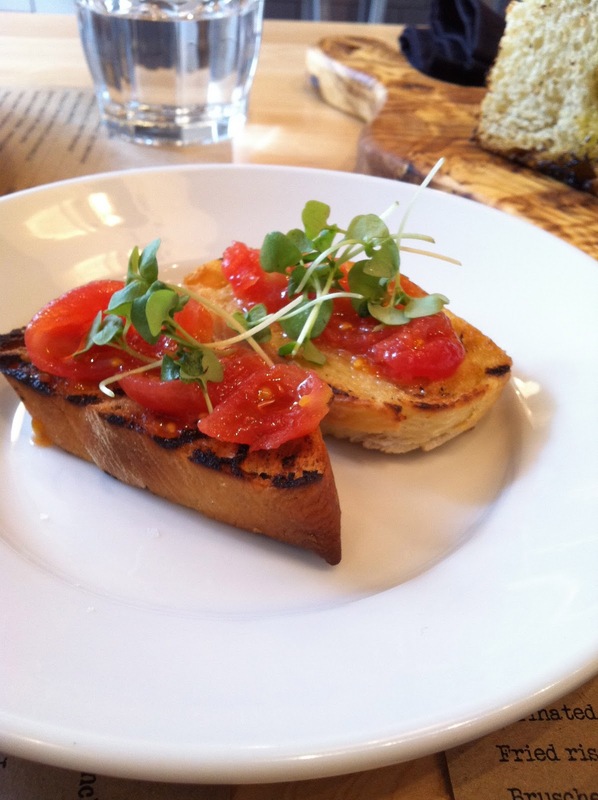 Cherry tomatoes were halved and served on a toasted piece of bread with watercress garnished on top. Flavours were light and refreshing. The next to arrive was the feature frittata. This little wedge of omelet is stuffed with cheese (I forget which kind) and potatoes. The pie is then topped with watercress. Borgo really likes the watercress. More stuff began arriving. Next up, the eggplant frites. Deep fried to order, the outside batter was light and crispy while the inside was moist and juicy. It is served with a fennel yogurt for your dipping pleasure. Really good! The prawn were the next to arrive. Served with a sprig of rosemary, the prawns were seared to a golden brown. Perfection! The next to arrive was the arancino of risotto. These little balls of rice are stuffed with cheese and served in a tomato paste. This next dish, which looks sort of like the risotto balls before, is the meatballs. Served in a tomato paste, the meatballs were firm and meaty. Also served in a tomato paste is the calamari. Not deep fried, it was a refreshing way of presenting the ingredient. The meat was surprisingly not very chewy but rather tender. Strange. The most disappointing dish of the day was the beef skewer. Beef skewers, in my mind, entails large chunks of meat (in this case, beef) speared together with a medieval claymore and served over a raging fire with sweet cow juice dripping off the oh-so-very-tender medium rare bovine flesh. This was not the case at Borgo. I can live without the raging fire but the toothpick size (exaggeration) brochette featured a small film of beef wrapped along its length and served on a plate that was 10 sizes too big. It was a little disappointing. Taste wise, the beef skewers were pretty good. I think the trick is to eat it with your eyes closed. Some of you are probably wondering 'But David, that's dangerous! What if I poke my eye out with the skewer?!' Fear not loyal reader! This item is no longer served at Borgo (Not surprised). The world is at peace once again! The last savory dish to arrive was the sautéed mushrooms in a wine sauce. The dish was very fragrant and tasted equally delicious. The sauce was rich and creamy. It came with two slices of bread which was definitely not enough to scoop up all the sauce. I dipped the last remnant of my focaccia bread to soak up the remaining creamy goodness. We finished off our tapa dishes with an americano and the dessert combo. Served on a silver platter (why aren't more things handed to me like this? ), we have the quartet of tasty dessert. In the top centre, we have the classic cannelloni. One of the ends is dipped in chocolate and coated with pistachio. It is finished off by dusting it with icing sugar. Working in a clockwise direction we have the rum baba. This yeast cake is soaked with liquor and served with whipped cream and strawberries. The cake is soft, moist and most definitely melted in my mouth. Rum oozed out of the cake as it is compressed. Heavenly. In the bottom left, we have the almond tart with gelato. The tart had very rich almond flavours. The gelato was smooth and creamy. Delish! The final dessert was the mix berry semifreddo. This frozen "half cold" dessert is made with whipped egg whites and whipping cream folded into it. As a result, when frozen, it does not get as hard as ice cream. Though described last, we ate the semifreddo first so it didn't melt into a sloppy mess. Atmosphere: 8 out of 10. Beautifully decorated interior. The restaurant was busy the whole time we were there. Very lively. Food: 8 out of 10. The food was very good. Some better than others. Presentation: 7 out of 10. Above average presentation overall. Price: 7 out of 10. Many items are offered per piece but adds up quite quickly. So keep that in mind when you order. The menu is fairly straight forward. But if in doubt, inquire with your server. Which brings us to the next point. Service: 9 out of 10. Incredible service. Our server was very knowledgeable of all the dishes. Very friendly and attentive to our needs. Our waters were consistently topped up that my mom complained that I never drank any water. I swear I drank lots! Overall: 8 out of 10. Good food, warm inviting atmosphere and amazing service. Borgo Trattoria. Check it out! Bring your friends. Traditionally located in or near the core, Japanese restaurants have recently been popping up in the north west like pimples on a pubescent teen. Taiyo, Ajisai and now Koiji Restolounge. 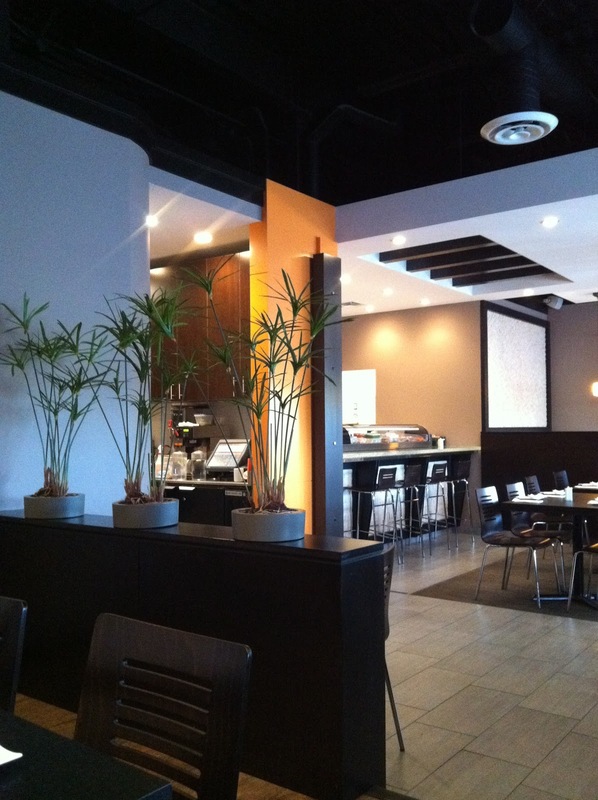 My latest food adventure (From this summer, I have a huge backlog) takes me to Koiji Restolounge up in Country Hills. Located across the street from the T&T market, it has arguably the best location out of the three that I mentioned above. Asian people love sushi. Ironically, when we arrived that Sunday, the space was mostly occupied by white people. Which, I guess explains the restolounge part. We were quickly seated upon arriving. The space was beautifully decorated complete with a trendy faux fireplace along the elevated seating area which I never got a picture of. Browsing through the menu reveals a solid selection of hot and cold appetizers. Those who know me will no doubt tell you that I love appetizers. In fact, I love appetizers so much that I can skip the entree altogether. In addition to the appetizers, there are a bunch of other stuff you can order; tempura, grilled fishes and what not (but no zaru soba, katsudon or tonkotsu ramen). Oh, and then there's the sushi list. But that's a given. Except maybe at Ajisai. The sushi list was decent too; offering a solid lineup of raw seafood, including three types of salmon, the presumably-wild-sockeye-salmon, the no-doubt-farmed-atlantic-salmon and the for-the-people-who-pretend-they-eat-sushi-smoked-salmon. No fancy exotic fishes though. Unfortunately. We ordered our usual favorites plus some; salmon of the sockeye variety, hamachi, scallops, octopus, toro, amaebi (sweet prawn) and botan ebi (Canadian sport prawn). The waiter returned shortly after we placed our order to inform us that they had run out of toro. I don't know what everyone’s experiences are, but I don't think I've ever had toro north of 20th Ave. Do they not swim this far beyond of the Bow? But I digress. Koiji Restolounge offers two types of shrimps. Nay! Three types! Amaebi, botan ebi and ebi. Besides being ordered alphabetically, the preceding list is also ordered based on awesomeness. Amaebi is a true prawn served raw. The flavours are sweet. So if you can stomach it, I highly recommend it. 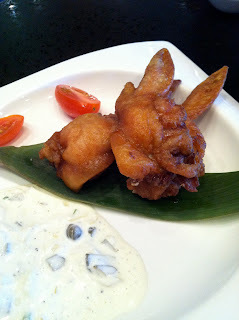 What I like most about Koiji is that they pre deep fry the head so you can nibble on the little claws when you please. Points for saving me the trouble of having to ask the server afterwards. Next on the list is the botan ebi. 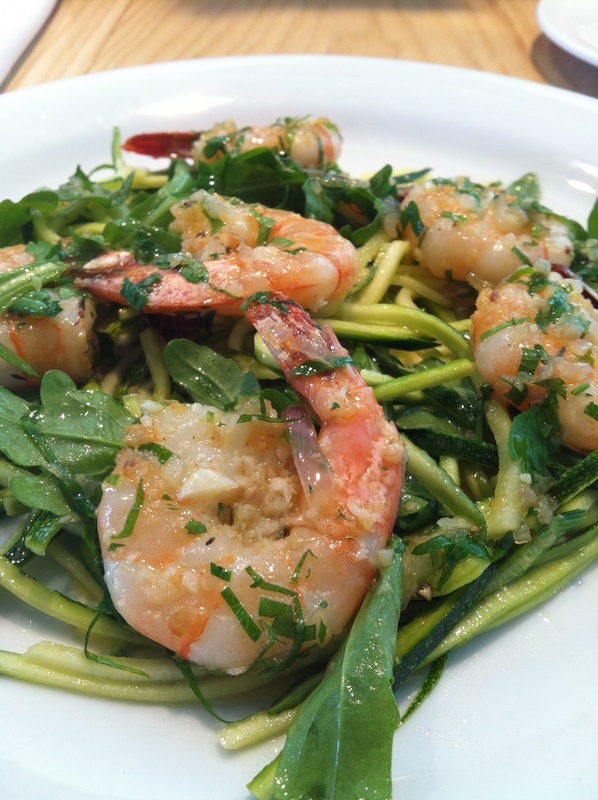 This dinky little shrimp is also served raw and comes as a pair. Flavours are sweet but it's too little and does not come with a deep fried head. And lastly, we have the ebi. Which I never order individually. This oversized cocktail shrimp is typically served cooked and cold. Lame. Moving on. Sockeye salmon was the preferred choice of the three available. Generally more flavourful, the sockeye salmons exhibit flesh that is typically redder in colour, I'm pretty sure it has something to do with the food they eat. The scallops could have been a little fresher. A little too mushy. Nothing special about the hamachi or octopus. Oh and we also ordered the "Stampeder" roll. Also known as the rainbow roll at other sushi establishments, this roll consist of a bunch of fish rolled up in rice with strips of avocado, ebi and salmon layered on top. It's missing quite a few hues of the rainbow so many places have opted to rename it the "Stampeder" roll to avoid the confusion. Not sure how that one works elsewhere though as I believe it is named after the Calgary Stampeders. If it's not, then it makes even less sense. How about Truncated Colour Spectrum Roll™. I guess it doesn't have the same ring to it. The seafood miso soup was the first to arrive. This hearty bowl of soup consisted of shrimp, scallops, crab, mushroom, tofu, wakame and a bunch of other stuff (It was a long time ago). It was really flavourful. Sweet from the plethora of seafood. Very tasty and only 3 dollars more than the regular miso soup… Sorry, organic miso soup. The seafood one is organic too. Definitely worth the money. Regardless of whether they used organic miso or not. We also ordered two appetizers. After yammering on for a full paragraph about how much I love appetizers, how could I not? The first to arrive was the salmon yukke. Korean inspired, this dish is the tasty offspring of a steak tartare and bruschetta; except it's made with salmon and not beef. This dish basically consist of diced salmon and avocado marinated in a tangy special sauce. This is then served over a slice of garlic toast. This is one of those restolounge-fusion dishes I was talking about. The final dish to arrive was the chicken karaage. Chicken wings, stuffed with fish roe, is deep fried to the max and served with a dipping sauce. It was ok. The lack of bones in the mid wing section was nice. Atmosphere: 8 out of 10. Beautiful interiors. It's hip. It's trendy. It's the little details. But the fireplace was definitely a contributing factor. Everyone loves fireplaces right? Food: 7 out of 10. Food was good. It's definitely more Japanese fusion than traditional Japanese. Especially the none sashimi items. So just keep that in mind when you make a trip out. Don't go leaving angry comments when you find weird sauces on your food. Presentation: 6 out of 10. My cup was dirty and stained. At the time of visit, they were opened for maybe a couple of weeks? Time to ask for a refund on that dishwasher. A replacement cup was provided with no fuss. Presentation of the food was good. The cup dragged it down. Price: 7 out of 10. Above average prices. 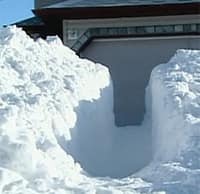 Not sure what everyone is complaining about. I don't think I've ever had "cheap" Japanese food. Service: 6 out of 10. Average service. Nothing to email home about. Overall: 7 out of 10. Good overall. It is interesting to note that Koiji claims they are the first Japanese restaurant to serve "Japanese burgers" which I’ve coined Jurger™ (Sounds like I have a slur). Not sure what that means. I don't believe the Japanese were known for their burgers. It's probably another one of those fusion things. Maybe they're trying to be the next JapaDog… I may give that a try on my next visit. My experience at Vicious Circle is one of love and hate. Love the food; Hate the time it takes for said food to arrive. My latest visit was no different. Though I do feel there was a slight improvement this time around. The restaurant was almost vacant when I arrived, only a couple of tables were being occupied. And remained that way for the duration of our stay. One of the coolest things at Vicious Circle is the menu; It is printed on a steel plate. Not totally sure how that one works with a couple of drunk dudes on a Friday night... But it is still cool nonetheless. Printed on both sides, the menu offers an excellent variety of pub fare. Although an update is overdue as there are several items crossed out with a jiffy marker. I quickly settled on a BBQ steak melt upon finding my friends Jordan and Russ who arrived early to make sure we got a table (Just kidding, I was just stuck on the phone). The idea here is if you order quick enough, you might get your food faster. Well, that's the idea anyway. My meal arrived about 30 minutes later (New Record!). Marinated in a tangy BBQ sauce, tender strips of steak are served on a piece of toast with mushrooms, onions and tomatoes. It is finished by melting a medley of cheese on top. It comes with a choice salad or soup. I was informed the feature soup of the day was chicken noodle (I love chicken noodle soup!). Unless they pureed the crap out of the noodles, this most definitely was not. No matter, cream of chicken is also tasty. Atmosphere: 5 out of 10. It's pretty cozy with the couches and what not but, like the menu, a reno is probably overdue. Food: 6 out of 10. Average food. Presentation: 6 out of 10. Average presentation. Price: 6 out of 10. Average price. Service: 5 out of 10. Needs to speed it up a little. But other than that, service was decent. Overall: 6 out of 10. Average. Maybe just order a few martinis. If you are made of money. One of my new favourite Japanese dishes is the Katsudon. This popular Japanese dish features deep fried pork, eggs and sauteed onions over a bowl of rice. It is super tasty. My favorite rendition of this dish is at Wa's. Though to be fair, I've only had it at two places. The other being at Sumo on Tenth. So that's a pretty small sample size. They were both pretty good but Wa's was better. The breaded pork pieces were juicy and tender. Eggs were beat and mixed in with the pork and onions to fused them together into one giant blob of deliciousness. It is then served over a bowl of rice and garnished with nori, scallions and two wedges of pickled daikon. Mmm mmm good! What's a visit to Wa's without a plate of my favorite sashimi? Amaebi, toro, hamachi, salmon, scallop and tako oh my! Atmosphere: 7 out of 10. Despite recent renovations, the interior is still very time worn. It does not feature fancy electric fireplace or designer decor. Food: 9 out of 10. No. Wa's is all about the food. Tasty, scrumptious and succulent food. Fresh and full of flavour. Price: 6 out of 10. A little pricier that other sushi places around town but you get what you pay for so it is well worth the money. Service: 7 out of 10. Despite being busy, the service was attentive. Overall: 8 out of 10. I'm jonsing for some Katsudon right now! Did you know "katsu" is a homophone to the verb "win" in Japanese? Now you do. Checked out Cassis Bistro a couple of weeks ago. 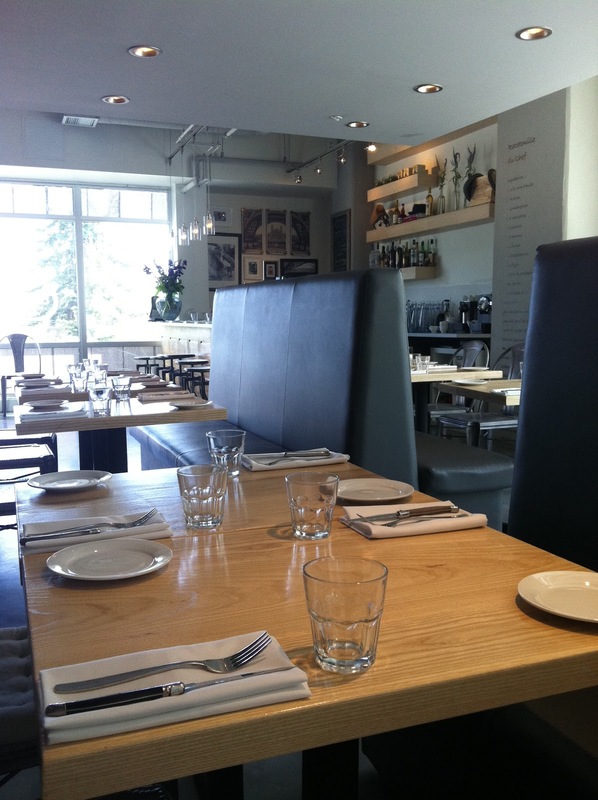 Located on the main floor of the new Casel condo building on 17th near Crowchild, Cassis Bistro features a market next door similar to Mercato, except French cuisine is served instead of Italian... The decor is simple and tasteful; Lightly coloured walls contrasted the dark furnishings. We were promptly seated upon arriving. Only a few tables were occupied when we arrived. The menu offers wide variety of dishes so there is always something for everyone. To start, we had the sautéed shrimp. 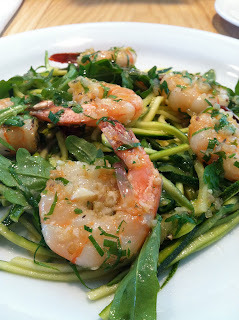 It came on a bed of zucchini and arugula. I was super impressed with the uniformity of the julienned zucchini. It looked like a plate of spaghetti. The sautéed shrimps were cooked to perfection. Sautéed in butter and garlic, the meat was firm and most definitely delicious. My only complaint was that it was a tad oily. For my main, I had the lamb skewers. Solid sized cubes of tasty marinated lamb were speared with a brochette and alternated with onions and peppers. Each order came with two skewers. The meat was very tender and flavourful. A baked tomato provencal (Tomato stuffed with bread crumbs) accompanied the skewers with a bed of gnocchi underneath. So good! My mom had the salmon which featured skin that was crispier than the leading brand of potato chips. Not even exaggerating. Ok. Maybe a little bit. But super crispy nonetheless. More testimonials here. Not only did it have super crispy skin, it also featured super moist flesh. A very solid dish. 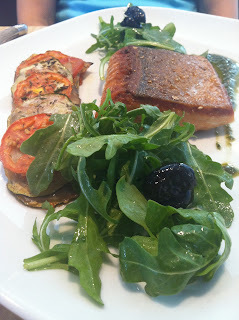 As for the side, this dish featured a tomato, zucchini and eggplant tian and salad. A tian, in a F-Log For Thought style description (Basically one giant run-on sentence), consists of paper thin slices of vegetables layered over each other and baked into a strip of glorious crusty awesomeness. What's so great about it is that the flavours of each ingredient is melted into the next. Heaven! Atmosphere: 8 out of 10. The interiors was simple and clean. Large windows let in ample natural light to keep things nice and bright. Food: 8 out of 10. Food was pretty amazing. Ingredients were fresh. Extra points for potato chip-esque salmon skin. Presentation: 7 out of 10. Above average presentation. Price: 6.5 out of 10. A tad on the expensive side but well worth the money. Service: 8 out of 10. Friendly and attentive service. Our server was very knowledgable of the dishes. Overall: 7.5 out of 10. A great little place. Welcome to the 2011 edition of F-Log for Thought's adventure at the Taste of Calgary. Click here for the entry from last year. And as always, this is posted several weeks after the event is over so you're probably jonesing for that thing that I ate and you passed on because you weren't sure if will be taste good or not but now it's too late. After a short relaxing 14k run with Maria on Sunday morning, I decided to check out the Taste of Calgary at Eau Claire after a quick shower. 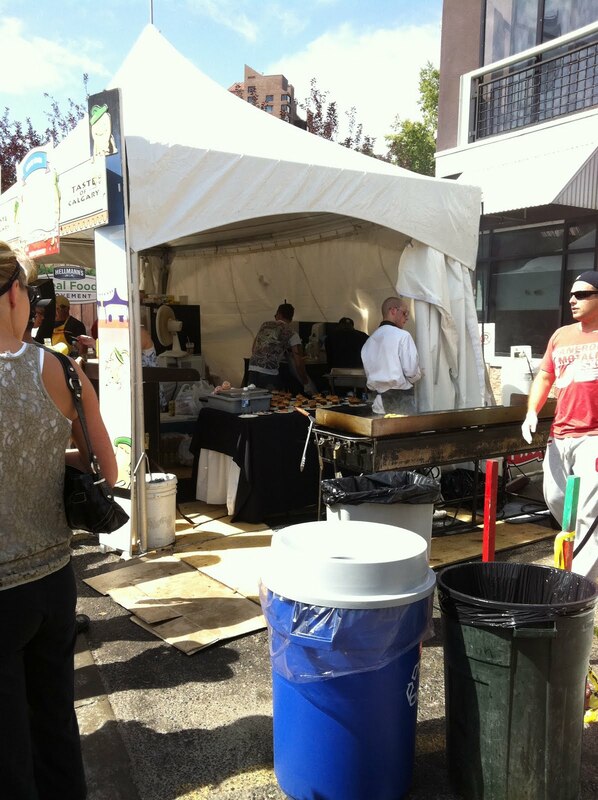 For those who have never been, Taste of Calgary occurs every year around the middle of August. Various restaurants around town congregate in the courtyard area at Eau Claire Market to serve up tasty samples of their menu. It is the perfect time to try out that restaurant you've been eyeing but couldn't commit to eating a full order of that thing they serve. All items are sold for tickets (They don't want your dirty money) ranging from 1 to 5 tickets each. Tickets can be purchased for $1 each at various booths on site. A tip from a Taste of Calgary veteran: Don't line up with the other ten thousand people at the entrance to get your tickets. There's probably a vendor around the corner twiddling their thumb longing for social interaction. Remember: time spent in line is time spent not eating delicious food. The exception to this rule is when you are lining up for delicious food. But only because they sell out sometimes. There's a variety of non food vendors but this is a food blog so we'll skip right on over to what you came here for. Back again this year is Nubian Express. They were sold out of many of their popular items last year so I made my way there first this time around. Small sample dishes were set out to show what was what. I had an order of coconut rice with beef and a separate order of plantain. To be completely honest, I think I enjoyed the chicken from last year better. The chicken didn't look as appetizing this year. Taste wise, the beef was decent but it was a little on the thin side. The plantain were cut up into small pieces this year rather than serving them as giant blobs of deliciousness from last year. Texture was a little crispier. For a total of seven tickets, that was a pretty significant increase from last year (40% increase). I wish my salary increased by that much. 8 stars out of 10 for both the coconut rice with beef and plantain. Photo of the chicken in the second photo below. Pacific Hut was the next vendor I hit up. I had an order of BBQ pork skewer (Second photo, if there was any doubt about that). It was very flavourful. It may have been a tad undercooked... I'm still kicking so it was probably alright. To wash it down, I had a refreshing sago and gulaman beverage (First photo). It was sweet and syrupy. Nice and cold. 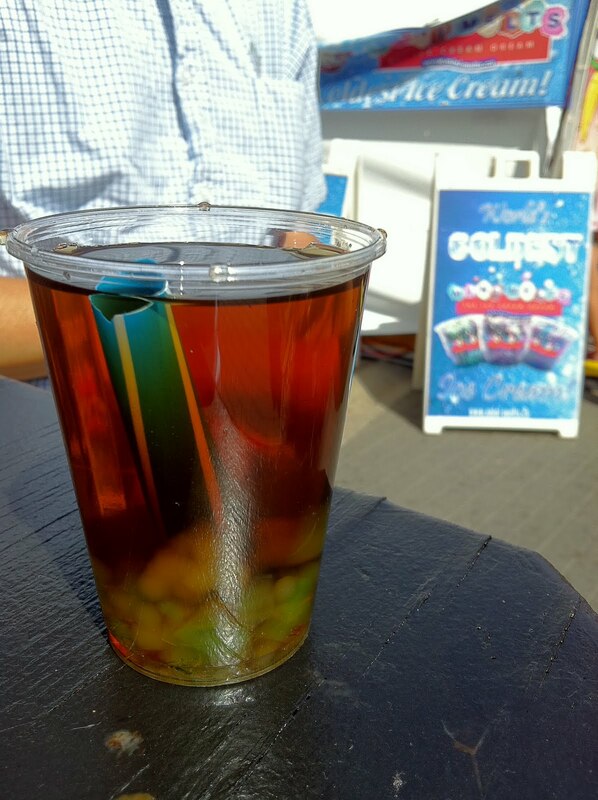 Perfect for a hot summer day! Best of all? It only cost one ticket. So I doubled fisted it like a champ. 5 and 9 stars out of 10 for the pork skewer and beverage respectively. Next up - Delicious Thai. We hit the lines as I was finishing my tasty drink. The line was fairly long. When I got to the front, I placed my order. "One Pad Thai please!" The lady opened the tray to reveal a couple pieces of scraps left. That should have been my cue to order something else. But I wanted my Pad Thai. And to be honest, I am most definitely regretting it. 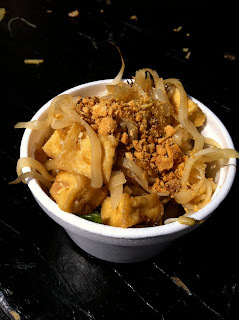 My bowl consisted of mostly tofu, a couple of pieces of noodles, sprouts and a nice garnish of crushed peanuts (that was all me though). It was a little on the dry side. I was expecting it to be a bit more moist. Taste wise, it was ok. I think it was mostly because I had the bottom of the barrel scraps. : ( 6 stars out of 10. 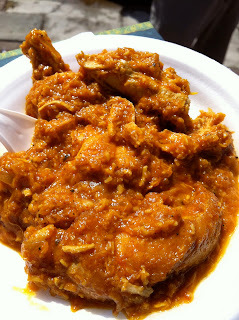 Coconut curry chicken was one of many dishes offered by La Jawab (I got a weird warning message when I checked out their website but it's totally legit). Upon ordering, a spoon full of the orange gobbly goop was slapped onto a styrofoam plate. I know what you are all thinking "Sick David! That looks like a plate of your own vomit!" 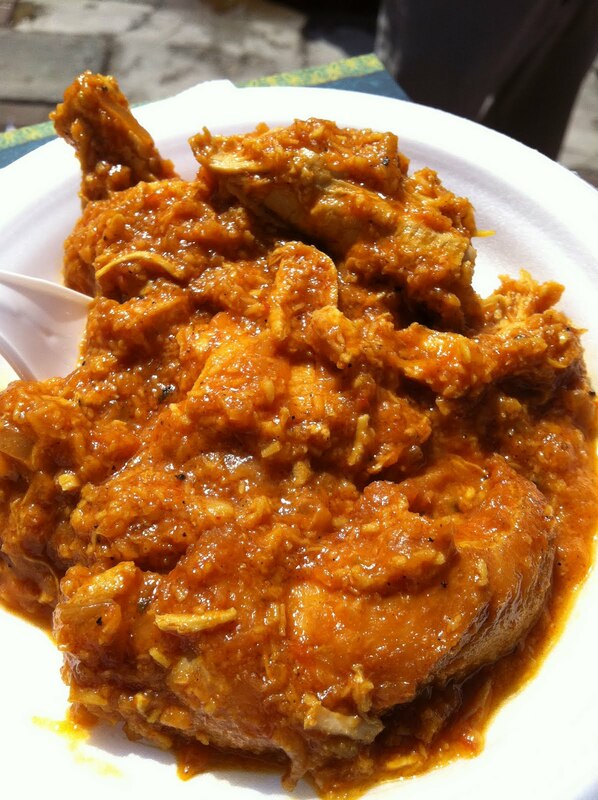 But I can assure you that it was in fact sweet tasty coconut curry chicken! The meat was tender and the sauce was super fragrant and delicious. I wish there was rice so I could soak up all the tastiness. Wouldn't do that if it was vomit, that's for sure! 8 stars out of 10. I've been to loungeburger a few times in the past and despite the massive lineup, I decided to check out their curry lamb meatballs. Each little meatball cost 2 tickets. Although it was pretty delicious, I thought it was a bit overpriced. 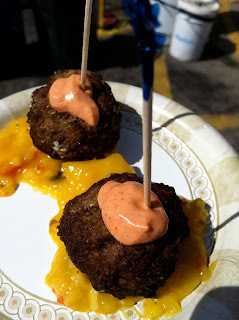 Served over a mango chutney, the goat cheese stuffed meatball is finished off with a tandoori aioli and a fancy cocktail stick (The kind I didn't want to throw on the BBQ). The meat was firm but not hard. 6 stars out of 10. My last stop of the day (for savory items anyway) was Pegasus Greek Restaurant. 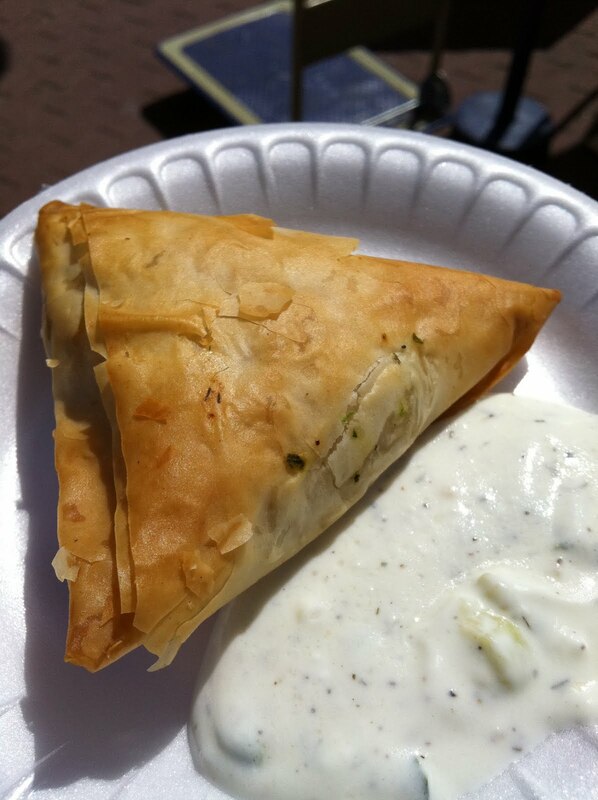 I had the Spanakopita with tsatziki. This savory pastry features a flaky shell. Taking a bite revealed the tasty spinach and feta cheese stuffing. So good! 7 stars out of 10. 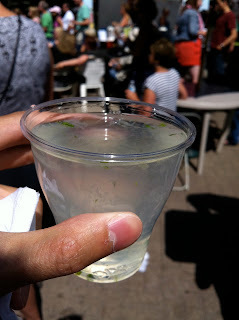 I finished off Taste of Calgary 2011 with a moijto from Soho Bar and Grill. After an sizzling afternoon of greasy foods, my bevy was extra refreshing. Mmmmm... So good! 10 out of 10. Another Recipe! From the cookbook Hot, Sticky and on Fire by Ted Reader comes this gem with minor modifications courtesy of my friend Heather. This dish is perfect for those lovely summer days sitting in front of the soothing glow of a flickering campfire (Now, I know those days are few and far between here in Calgary, but for the readers in sunnier pastures, give it a shot, you won't be disappointed). So what fancy ingredients are required? Well. As the name suggests, bananas and bacon. Lots of bacon. 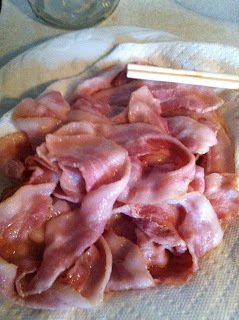 Step 1: Partially cook the bacon. Make sure it is still flexible enough so that you can wrap it around the bananas. Remember crispy bacon, though tasty, is not good wrapping bacon. You will likely want to soak up all the fat that will inevitably be oozing out of the meat. Step 2: Peel bananas and wrap them with the bacon from Step 1. For a standard sized banana, it will take about 1 to 2 slices of bacon to fully cover it. But my banana is exceptionally large (That's what she said), and thus required at least 3 or 4 slices. 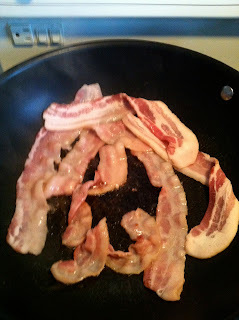 Unfortunately for me, I did not purchase enough bacon (I know it's hard to believe but it's true, I wasn't trying to be cheap) and due to time constraints, I did not have enough time to buy more. 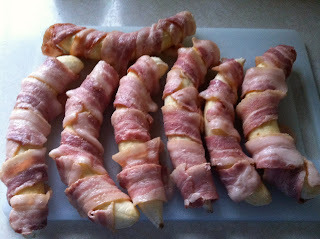 I settled with two slices of bacon per banana and loosely wrapped them around (Mistake #1). Instructions in the book also calls for toothpicks to hold the bacon in place; however, I only had cocktail sticks with the fancy plastic at the ends. And since I had to throw these into a raging fire after, I felt that it was probably not the best idea to have small pieces of plastic on the end. Though, not properly securing the bacon around the bananas was also not the best idea (Mistake #2). So... Note to readers: buy toothpicks with no fancy plastic at the ends. You'll thank me later. 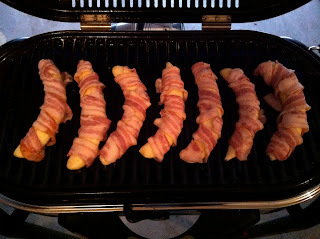 Step 3: Throw these bad boys onto the grill. Turn them occasionally to prevent burning. 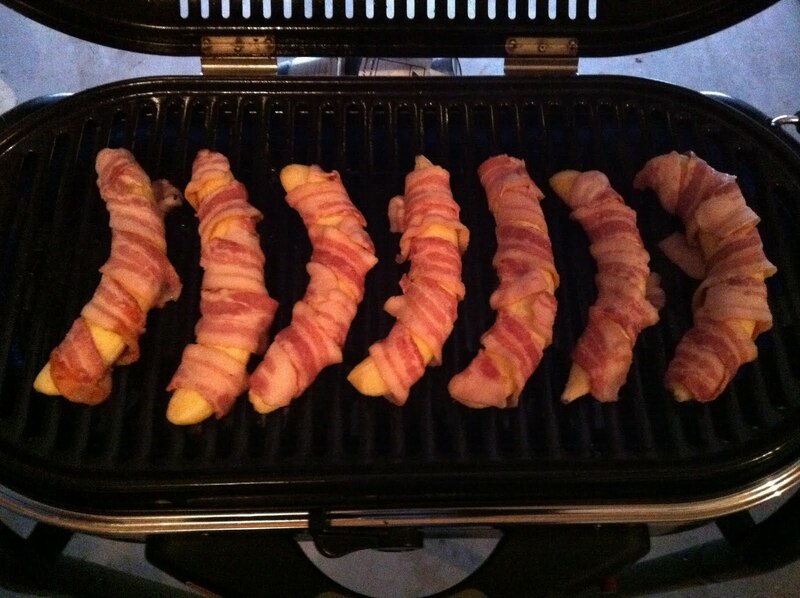 Grill until bacon is crispy. As it turns out, flipping the bananas over without completely destroying it is a much harder task than I had anticipated (Likely due to the lack of skill more than anything). As the banana cooks and slowly caramelizes, they become rather tender and mushy. And thus trying to pick them up with tongs and turning them was a nightmare. I was turning my hand (and body) ever which way to try to flip the bananas without squishing them. The result? Squished bananas and looking like I'm severely handicapped. Sprinkle with pepper for taste. Baste with the special sauce during the final few minutes (Instructions to follow). Step 4: Serve with sauce and ice cream (Not shown). 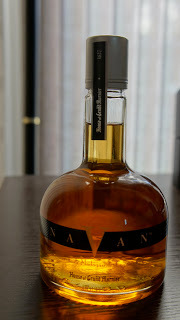 2 oz Bourbon or Navan <-- This is the secret ingredient! Shhhh...! Step 1: Take a saucepan. Throw everything into it. Crank up the heat and let it boil. Stir occasionally to prevent burning. Reduce heat and let it simmer for 5 minutes. Remove and let cool. Step 2: There is no Step 2! Probably in that order. In reverse. Give it a shot. Let me know how it turns out! Where Am I Eatin' At? Apparently downtown and inner city area. Check it.